We consider a supersymmetric type III seesaw, where the additional heavy states are embedded into complete SU(5) representations to preserve gauge coupling unification. Complying with phenomenological and experimental constraints strongly tightens the viable parameter space of the model. 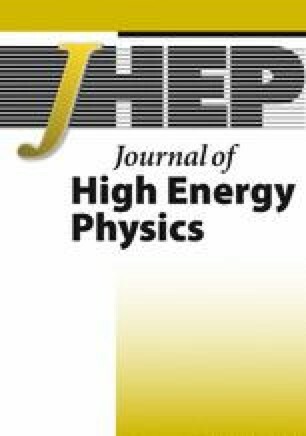 In particular, one expects very characteristic signals of lepton flavour violation both at low-energies and at the LHC, which offer the possibility of falsifying the model. P. Minkowski, μ → eγ at a rate of one out of 1-billion muon decays?, Phys. Lett. B 67 (1977) 421 [SPIRES]. R.E. Marshak and R.N. Mohapatra, Selection rules for baryon number nonconservation in gauge models, invited talk given at Orbis Scientiae, January 14–17, Coral Gables, U.S.A. (1980) [SPIRES]. F.E. Paige, Determining SUSY particle masses at LHC, in the proceedings of the DPF/DPB summer study on new directions for high-energy physics (Snowmass 96), June 25–July 12, Snowmass, Colorado, U.S.A. (1996), hep-ph/9609373 [SPIRES]. ATLAS v collaboration, W.W. Armstrong et al., ATLAS: technical proposal for a general-purpose pp experiment at the Large Hadron Collider at CERN, CERN-LHCC-94-43 (1994) [SPIRES]. The ATLAS collaboration, G. Aad et al., Expected performance of the ATLAS experiment — Detector, trigger and physics, arXiv:0901.0512 [SPIRES]. SuperB collaboration, M. Bona et al., SuperB: a high-luminosity asymmetric e + e − super flavor factory. Conceptual design report, arXiv:0709.0451 [SPIRES]. COMET collaboration, Y.G. Cui et al., Conceptual design report for experimental search for lepton flavor violating μ −-e − conversion at sensitivity of 10−16 with a slow-extracted bunched proton beam (COMET), KEK-2009-10 [SPIRES].